Greetings! It's been a while since our last post, but things have been hopping over here at Bodacious Blends and we have some exciting news! Starting today, we've unveiled a new product line - Bodacious Blends Popcorn Sprinkles, a line of flavored salts designed especially to go with popcorn! For people with a sweet tooth, we have Brown Sugar Coconut Salt, a sweet and nutty concoction that gives your popcorn a zing of happy flavor. If you prefer something more savory, we have Rosemary Garlic Salt for an adult twist on the old standby of garlic popcorn or Tomato Basil Salt for a dash of Italian zest. Come on down to the Stangl Factory Farmer's Market every Saturday from nine to two to purchase any of our products! This Sunday, Bodacious Blends will be at the One Spirit Festival at the Clinton Community Center. Please come by and visit us! Greetings! Sorry for the hiatus. Ever since the Stockton Market booth fell through, we've been taking stock on our business model and where we want to head towards in the future (we've been taking stock on our actual stock, too). I'd like to assure you that Bodacious Blends still exists, and we still strive to provide our customers with high quality seasoning blends. Today, I'd like to share with you a sandwich spread/veggie dip made with Bodacious Blends Overtly Onion Dip Mix! It's a great way to use up leftover Overtly Onion Dip after a party has left you with a surplus, a situation we've found ourselves in after last Sunday. Mix 2 tablespoons each of Overtly Onion Dip and your favorite salsa in a small bowl until well blended. It makes a delicious burger topping, or you can just serve with cucumber slices as a snack. 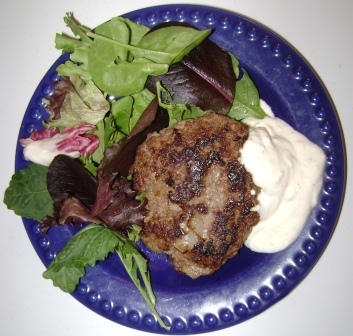 This is a turkey burger seasoned with Bodacious Blends Smoked Salt and served on a bed of mixed greens with Bodacious Blends Overtly Onion Dip on the side - an example of the kinds of creative cooking made possible by Bodacious Blends. What are ways you've used Bodacious Blends to liven up a recipe? Sadly, the planned Farmer's Market booth was canceled due to there not being a Farmer's Market last week. In brighter, happier news, however, Bodacious Blends will be establishing a stall at the Stockton Market at 19 Bridge Street, Stockton, NJ! Our first day will be Saturday, June 22. Visit the Market's website at http://stocktonfarmmarket.com/ for hours of operation and directions. Greetings! I'm pleased to announce after several tastings and revisions, the first of the Bodacious Blends Dynamic Dips product line has been created - Veggie Mania! A single packet of Veggie Mania makes eight ounces of a frankly delicious dip - at least one of the tasters declined to share her portion with...well, anyone at all. Also, tomorrow will be Bodacious Blends first day selling at the High Bridge Farmer's Market - feel free to come on down and peruse our wares! A busy and exciting weekend! On Saturday we were at the local soapbox derby. In addition, on Sunday I created a new recipe using Bodacious Blends: Roasted Citrus Pork! Start with a large yellow onion, removing the outer layers and slicing into long strips. Place in the bottom of a roasting pan, then place a boneless pork roast on top. Coat the roast with a neutrally flavored oil, then add one packet Bodacious Blends Citrus Blend to the pan, evenly coating pork. Add some water to the pan and roast, uncovered, at 375 degrees for an hour and a half. The end result should be a moist, fully-cooked pork roast with a delicious citrus tang.